The similarity between the Metro stations and palatial halls is striking. Canadian photographer David Burdeny traveled in Russia, shooting a series of photos. 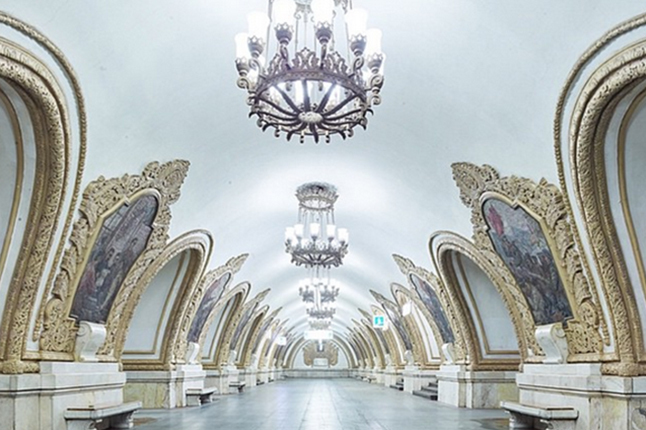 Now his photos of Moscow Metro stations have gone viral, and we’ve taken the opportunity to look at his Instagram account. Among photos of New York and Havana, we find some that are familiar: Metro stations and theaters in St. Petersburg and Moscow, former tsarist residences, and interiors of the Hermitage. The similarity between the Metro stations and the ornate palatial halls is striking. Called “Bright Future”, the series shows the splendor, beauty and unreality of Metro stations and palaces. It looks a bit magical, a bit surreal. / Komsomolskaya metro station, Moscow. Yusupov Palace Theatre , St Petersburg. Red Room Yusopof Palace, St. Petersburg. Chinese Blue Drawing-Room, Catherine Palace, Tsarskoe Selo. Yusupov Palace Theatre (curtain), St Petersburg. Avtovo metro station, St. Petersburg. Who else to follow to get to know Russia better? Check out our Top 10 list.